I have always been an avid reader and as a child found myself entranced by the books of Alf Wight writing as James Herriot. Every few years, I pick up the books again and read all about this country vet and find that my love for these books only grows as I grow older. 'All Creatures Great and Small', 'All Things Bright and Beautiful', 'All Things Wise and Wonderful' and 'The Lord God Made Them All' are still treasured volumes in my personal library. I was so inspired by his description of the Yorkshire Dales, that I knew some day I would journey to this magical place and become as delighted with the Dales folk and the lovely countryside just as he was. My Yorkshire experience came 60 years after James Herriot's but I was thrilled to find so much of still just as he had written it. I still remember vividly the first time I saw the centuries-old stone walls crisscrossing the hillsides while sheep grazed in nearby pastures, totally oblivious to the spectacular scenery that they were part of. As we drove up winding country roads and swooped down into enchanted small villages, I felt as if I had gone back in time and I would soon meet James, Siegried or Tristan passing by in an old jalopy. I could not wait to get to the village of Darrowby(Thirsk in real life) where James, Helen, Tristan and Siegfried lived and also had there vetrinery practice at Skeldale House. 23 Kirkgate is still there and is now the World of James Herriot where you can take a journey back to the 1940's and to the life and times of these country vets.I have now visited these places many times and the magic only continues to grow. I still take excursions through the Dales searching out new tearooms and adventures and finding new spots to add to our tours. I love to visit Thirsk and Skeldale House, the lovely tearooms and museums in Reeth, the Wensleydale Cheese Factory, Castle Bolton, Castle Howard, Ripley Castle and Skipton Castle. 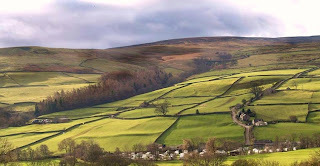 I love the picturesque villages of Hawes, Ripon, Osmotherly, Helmsley, Pickering and Malton. I love the city of York with its Minster, the Shambles and Whipmawhopmagate Road. The Yorkshire area of England is one of the most lovely of the entire country and always holds a very special place in heart.